Neutron moisture meter (NMM) calibration accuracy and precision must be done to obtain reliable results. 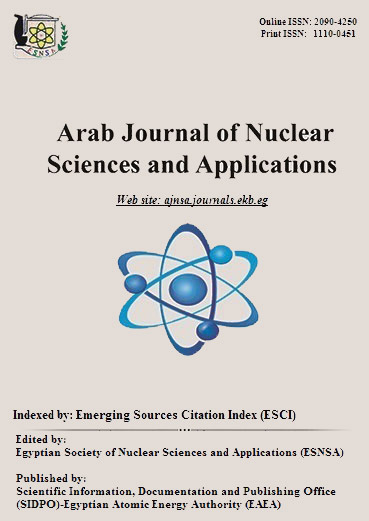 The aim of this study was to investigate the effect of applied organic manure on neutron moisture meter calibration curve of sandy soil. The experiment was carried out at the farm of soil and water department, Atomic Energy Authority. Two rates of organic manure were added (48 and 71.5m3/ha) including untreated control to surface sand soil at depth 20 cm. Neutron moisture meter calibration curve for 30 and 50 cm depth were done, the results showed that a 30 cm depth the neutron calibration curves for three treatments have approximately the same slope, and there is differences in the intercept which were 1.131, 1.298 and 1.978 for rate 2, rate 1 and control, respectively. The values of volumetric soil water content versus count ration presented in Tables 2 and 3 showed that at the same count ratio the values of water content decrease with increasing rate of organic matter in the case of 30cm depth, for 50cm depth the values of soil water content approximately the same at each count.